On Monday I drove my parents to a hospital an hour away to get my dad's battery changed that powers his deep brain stimulation for Parkinson's. It was a minor surgery that lasted less than an hour, went off without a hitch, and he continues to make a painless recovery. 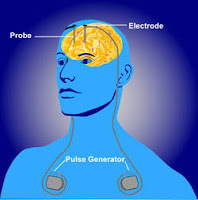 If you don't know what deep brain stimulation is (and don't want to follow the link) he basically has electrodes buried deep in his brain that are constantly stimulating a very specific area which completely stops his tremors. The battery is underneath chest tissue (the thing called the pulse generator in the picture). By the way, my dad's skin is not blue. Given that everything went well, why did I become so utterly exhausted? Most can probably relate to the experience of anticipating a loved one's surgery and the seemingly endless waiting. You're just waiting, but it drains you. I think it also transported my mom and I back to the original surgery which took over 13 hours. My dad was in the hospital for 10 days afterwards. He had aphasia and it took months for his speech to return to normal. Even though this was nothing like that, we saw him made up for surgery and I think our minds returned to that horrible time. I slept for almost 12 hours both Monday night and Wednesday night. I've been under a deadline at work and had to really force myself to stay on task. The pressure lifted yesterday afternoon. Since then I've been listless, unmotivated, even apathetic. For something so critical as this job to keep my family afloat, it seems reckless to be such a slacker. I say, "I would so fire me." on a week like this. Obviously I haven't felt like blogging much either. I can't believe I wrote five posts in five days a while back. That was definitely the up, and I'm definitely in the down now. As Mary said, it feels like in Monopoly... "Do not pass Go, do not collect 200 dollars, experience depression and moodiness from December to July." Just visited your blog and came to know it's very informative, he is a dad diagnosed with bipolar I, the electrodes used in the brain as battery are excellent technology, Great work.